Strawberry Mansion decorated for Christmas. Things you probably weren't expecting to find at a preserved 18th-century mansion unless it was haunted: an ice bar and a Gritty look-alike made from cheese. The Historic Houses of Fairmount Park announced details for this season's holiday programs. While popular events for "A Very Philly Christmas" are returning, there's also lots new for 2018. On Friday, Nov. 30, an ice bar will pop up at Lemon Hill Mansion for the first time. For two weekends, visitors can enjoy drinks from Original XIII Ciderworks and St. Benjamin Brewing Co., rotating food trucks, cozy fire pits and a nightly DJ. In December, the five festively decorated homes – Cedar Grove, Laurel Hill Mansion, Lemon Hill Mansion, Strawberry Mansion and Woodford Mansion – will offer drop-in tours ($8 per house, or get a $25 pass for all five). This year's decorations at Laurel Hill will include replicas of classic carousel animals on a 12-foot Christmas tree. 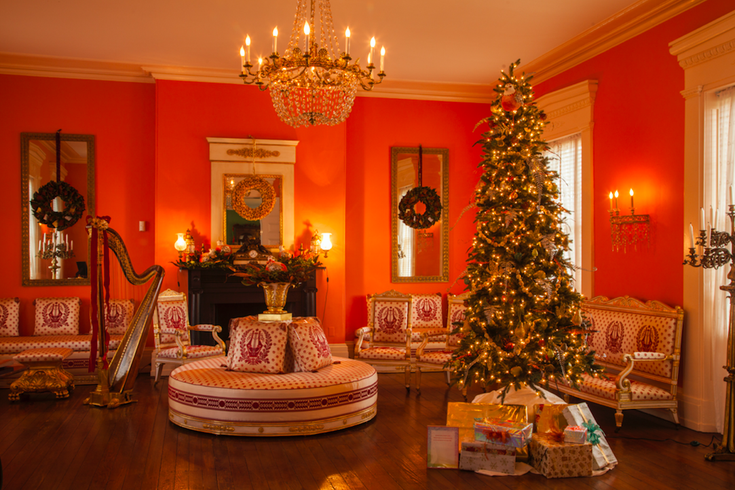 At Strawberry Mansion, decorations inspired by classic holiday stories will be on display. There's also an opportunity to tour the decorated houses during four theme days in December. The themes are music, food, neighbors and families. On the day dedicated to family, Lemon Hill visitors will be greeted by a cheese sculpture of Gritty, created by JVMP Food Sculpture in Conshohocken.